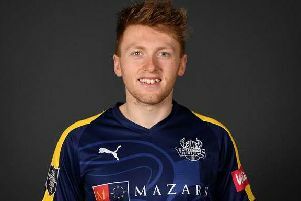 There’s no happier cricketer in the country at the moment than Sussex’s Laurie Evans. The 30-year-old admits it’s only now, at his third county, that he feels he is finally doing his talent justice after moving up the order into the top three. And off the field he is just as content. It’s been three weeks since Sussex reached Vitality Blast Finals Day and as Evans is not involved in the county’s bid for promotion in the Specsavers County Championship he has had some time to devote to organising his other big day this year – his marriage to partner Verity in December. “We actually met just before Finals Day when I was at Warwickshire and we won in 2014 so I have taken my time to get around to getting married!” he said. No one played a bigger part than Evans in getting Sussex back to Edgbaston for the first time since they beat this Saturday’s semi-final opponents Somerset to lift the trophy for the only time in 2009. Head Coach Jason Gillespie backed a hunch that Evans offered a bit more than the middle-order finisher’s role he’d previously had at Sussex and during his Warwickshire days. Will lucky socks play a part? Only Aaron Finch and former Warwickshire team-mate Ian Bell scored more than his 554 runs at an average of 79.14 during the group stages and he was one of only three batsmen to score six half-centuries. There are only two survivors from the 2009 team – leg-spinner Will Beer and opening batsman Luke Wright – in Saturday’ squad but Sussex have plenty of big-match experience. The bookies can’t separate them or Somerset as joint 11/4 favourites and the winner of their semi could well be the team who goes on to lift the trophy. Evans draws some parallels with the Warwickshire team he helped to victory in 2014. “Overall we’re probably a much younger side but we do have that big-match experience,” he added.